THINGS WORTH KNOWING CONCERNING THE FAMILY. (With thanks to Harry Caubo from Utah U.S.A. for the translation). 2. 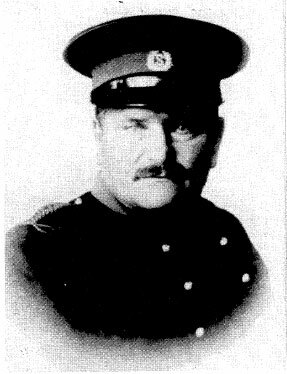 Chief of Police Jan Hendrik Caubo. 3. The Family of Chief of Police Caubo. 4. 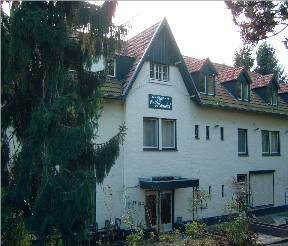 The original Home of the Family: The Rozenhof. 5. The Schin op Geul Swimming Pool. 7. "In Memoriam" Stone on the Church Wall in Schin op Geul. 8. Caubos in the U.S.A.
11. Jean Michel Caubo resistance worker and war victim. Caubo Jan Lambert born Apr 3 1829 deceased May 24 1907 and Dautzenberg Anna Maria born Mar 13 1835 deceased Jan 21 1913. 1. Maria Gertrudis born in Schoonbron May 26 1855. 2. Maria Catharina born in Wijlre Oct 1 1859. 3. Maria Gertrudis Hubertina born in Wijlre Dec 29 1861. 4. Elisabeth born in Wijlre Mar 21 1870. 5. Lodewijk born in Wijlre May 10 1878. 6. Joannes born in Wijlre Dec 5 1872. 7. Jan Hendrik born in Wijlre Dec 4 1865. 8. Hubert Joseph born in Wijlre Mar 9 1863. *Pieter Hubertus born in Wijlre Oct 3 1857. *Maria Johanna born in Wijlre Dec 23 1867. *Johannes born in Wijlre Dec 11 1864. *Maria Johanna born in Wijlre Dec 11 1864. 4 out of 12 had died before 1904. 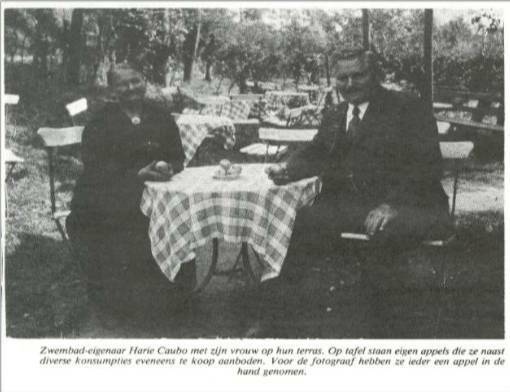 Jan Hendrik Caubo was born in Wijlre on Dec 4 1865, the son of Jan Lambert Caubo and Maria Dautzenberg. On Nov 8 1888 he married Maria Elisabeth Hubertina Direx and they had 11 children. He probably obtained his position of Chief of Police by answering an advertisement by the city council of Schin op Geul. Nine persons responded to the advertisement, among others Willem Bemelmans from the village of Strucht, Johannes Hubertus Geurts from Schin op Geul, Johannes Martinus van Mouche, railroad worker, who was born in Schin op Geul but lived in Kerkrade. Also a Theodoor Maas from Grubbevorst tried for the job. But he had served 15 days in jail for assault. The mayor of Schin op Geul evaluated the background of Jan Hendrik Caubo. He added the following remarks: "His behavior is satisfactory; his experience and ability is satisfactory as shown by his previous jobs; he has lived here for four years, but has no relatives in town". On March 10 1900 he received the position of Chief of Police and a yearly salary of 150 guilders, with the notation that it will be increased after a satisfactory performance. On August 22 1901 he reminds the city council in a letter: I have performed my work in a satisfactory and trustworthy manner and hereby request the promised raise in salary. His salary is upped to 200 guilders. 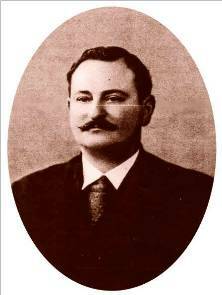 On June 25 1902 Jan Hendrik Caubo accepts an additional duty: He collects the city taxes and continues doing so until 1913. In September 1903 he petitions the city council to obtain a new uniform. He also requests a salary raise with the reason that he now has a large family and no jobs on the side. It appears that he was turned down and Jan Hendrik then takes his case to the queen's governor in Limburg. He (the governor) orders the city council on July 1 1904 to increase the yearly salary to 300 guilders. The city council appeals this decision but the governor declines the appeal. However the yearly salary remains a topic. On September 17 1909 the city council decides as follows: "Having received the petition from Chief of Police J.H. Caubo to increase his yearly salary, we have decided to increase that amount to 400 guilders per year effective January 1 1908 and in addition grant him two 3 times a year increases of 25 guilders each." As of February 1 1908 the council grants the Chief of Police an accident insurance policy with a premium of 6 guilders and 60 cents. On November he had one of his titles:"Onbezoldigd rijksveldwachter" taken away, whereupon he writes a letter to the minister of justice to be reinstated. However his request is denied because on December 21 of that year he receives a reply that contains the following: The results of an investigation have shown the facts of the matter and the decision of November 20 1908 will not be reversed and the loss of his title "Onbezoldigd rijksveldwachter"stands. That bribes around 1908 already existed shows when he had take an oath when Caubo was reinstated in 1912:" l hereby swear that in connection with my appointment as Chief of Police I have not paid or promised gifts to anyone including the city council, in the past now or in the future. On March 4 1916 the ministry of finance approves that the city of Schin op Geul grants him a pension in the amount of 425 guilders a year. That the Chief of Police has an aggressive nature shows in documents of the appeals court of 's-Hertogenbosch, where the conviction of Jan Hendrik Caubo is upheld on appeal and he is sentenced to a 25 guilders fine or 25 days in jail for assault. Due to a bicycle accident on January 19 1926 he has to take time off from his work and the insurance company pays him 25 guilders. That same year he begins to have health problems. On December 23 1926 the mayor of Schin op Geul writes in a letter to the queen's governor that the Chief due to illnes has not worked and performed his duties and the possibility exists that this could last through January. In a letter dated february 12 1930 Jan Hendrik Caubo requests that the city council adjusts his salary to the level of the chiefs in the surrounding cities, especially in view of the fact that he is getting up in age and begins to experience health problems. This will also increase his future pension. Because Caubo from March 5 1930 has not shown up in his office at city hall without giving a reason, the mayor writes a letter to the queen's governor, with a copy to Caubo, accusing him of little ambition and a negative job performence. But the Chief is smart. On March 12 he delivers a letter to cityhall with a letter enclosed by Doctor De Wever, an MD from the city of Nuth, who declares that he cannot work in the foreseeable future due to rheumatisme. It appears that Caubo did show up and made an appearance in cityhall on March 5 where the mayor ordered him to inspect a building ordinance in Gerendal. As he claimed he could not do that because of ill health, Caubo sent another officer in his place. He did this without the knowledge of the mayor. Tensions are now rising. On March 14 the governor writes a letter to the mayor asking him to persuade the Chief to resign due to advanced age. On May 5 the mayor writes a letter to Caubo as follows: "Due to the fact that you have not worked due illness for two months, but it is known that you are working around the house. So your illness is in question, I am requesting to resume your job as of May 15 or to turn in your resignation". In a letter to the governor dated June 4 the mayor writes that Caubo's salary has been increased to 1400 guilders effective January 1 1930. It is noted that:"Had the Chief's performance and ambition been more forthcoming, I am convinced the council would have raised his yearly salary long ago; after all the employee should be deserving of his pay. The council and the citizens are all critical in regards to the "illniss"of the Chief. He is working around his house, goes out, goes to the movies, bars etc. and during the last fair held in Valkenburg from June 1-3, he was there till late into the night". On June 12 Caubo is ordered to apply for retirement as of June 20. If not he will be fired. On September 1 1930 Jan Hendrik Caubo receives an honorable discharge with a pension as the Chief of Police of Schin op Geul. However he is not completely satisfied with that decision and requests a medical examination and applies for a disabled status also. He claims he hurt his back in the past due to the fact he had to haul heavy sacks of grain to the city hall's attic during the rationing period. It is very well possible that the Chief had already received an advance on his pension because on July 23 1940 the city attempts to confiscate his pension. This attempt however is declined by the united group of city councils. By now Caubo has moved to Oud-Valkenburgerweg 40, in the city of Valkenburg. As he is at bad terms with his children now, he declared bankruptcy and his possessions are being sold. The ex-Chief is there and wins the bid. But it turns out he does not have the funds and cannot come up with the money. One year later the possessions are being sold again and his eldest son buys everything. The remaining mortgage and the cost of the bankruptcy are so high, that little money is left. During that period the mayor writes in a letter to the governor:"Father Caubo (the Chief) has eleven fine children, who are trying to approach him and are doing everything to find better housing for him. Official city archives Schin op Geul and Valkenburg a/d Geul The Netherlands. Source: Periodic Heemkundevereniging Schin op Geul, author Dré Kickken. The Family of Chief of Police Caubo. 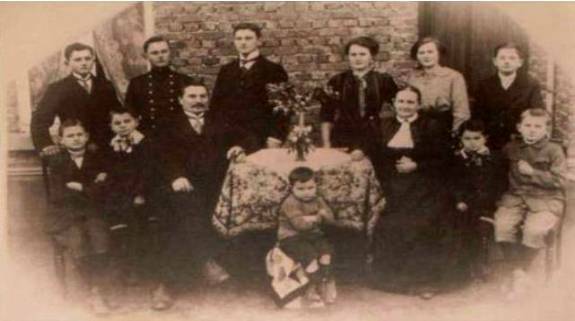 The family of Chief of Police Harie Caubo in Schin op Geul around 1912. Father Jan Hendrik Caubo born in Wijlre Dec 12 1865, mother Maria Elisabeth Hubertina Direx born in Voerendaal Feb 24 1865. 1. Anna Catharina (An) born in Schin op Geul Oct 28 1889. 2. Johannes Michael (Sjeng) born in Maastricht Apr 28 1891. 3. Hubert Joseph (Sjöf) born in Meerssen Apr 30 1893. 4. Andries (Andrees) born in Schin op Geul Sep 21 1895. 5. Maria J.G.M. (Mai) born in Schin op Geul May 23 1897. 6. Jan Gerard Hendrik (Harie) born in Schin op Geul Mar 25 1899. 7. Jan Lodewijk (Louis) born in Schin op Geul May 20 1901. 8. Hendrik Hubertus Eduard (Eed) born in Schin op Geul Feb 23 1903. 9. Johannes Gerardus (Sjir) born in Schin op Geul Nov 24 1904. 10.Johannes Hubertus (Hub) born in Schin op Geul Sep 12 1906. 11.Johannes Petrus (Piet) born in Schin op Geul Jan 12 1909. THE HISTORY of "HUIZE ROZENHOF". Above you will find two photographs of "Huize Rozenhof in Schin op Geul" as it appears today; now a hotel. It was built in 1912 by Chief of Police Jan Hendrik Caubo. 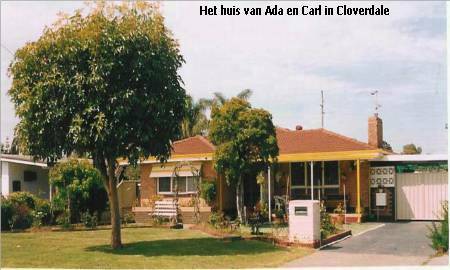 Here his eleven children (An, Sjeng, Sjöf, Andrees, Mai, Harie, Louis, Eed, Sjir, Hub and Piet) spent their growing-up years. This was the Schin op Geul branch of the Caubo Family. The Rozenhof, as previously stated, was sold in 1940. However, the estate, in later years came back in family hands for a brief period of time. In 1973, Harrie Evers (the son of Mai Evers-Caubo) purchased the property. 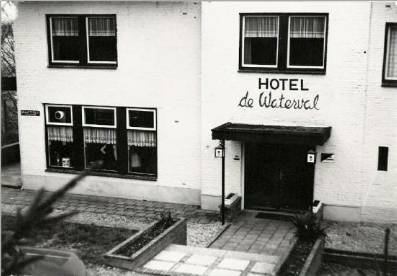 It had been renamed "Hotel De Waterval". As he was living in Curacao, he had a manager working for him. His brother Frans in the Netherlands supervised the business. Unfortunately Harrie Evers died in a tragic accident in Curacao. In 1976 the property was sold again. Unconfirmed rumors indicate that the buyer found an old painting in the attic showing "The Rozenhof" and decided to go back to the original name. 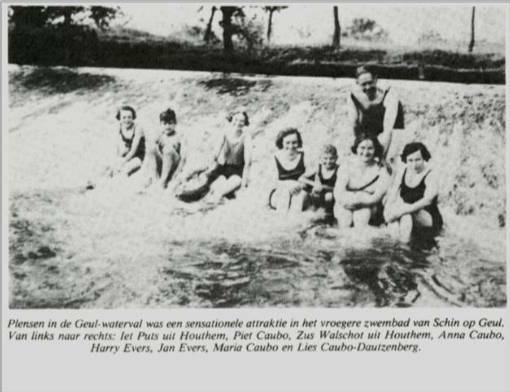 THE SCHIN OP GEUL SWIMMING POOL THAT DISAPPEARED. In Schin op Geul Jan Hendrik Caubo was the Chief of Police from the late 1800's till about 1930. In 1912 he built, on the top of a hill, an estate-like home, overlooking the Geul river. He called it "The Rozenhof". It still exists today. As of today, the early 21st century, it is still a beautiful hotel, located on a choice piece of property with a fantastic view. When he built it in 1912 there was no running water or electricity; the location was too isolated from the city. Water was provided by 2 pumps on the property. Wherever possible Mr Caubo was ahead of his time. With the help of batteries, he was one of the first in the area with a radio and telephone. The property was large and consisted of many acres, all the way into the valley towards the river, hundreds of yards away. It further reached to the Geul river falls making a connection possible to the waterlevels around "Kasteel Chaloen"and the watermill. 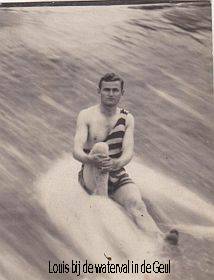 Jan Hendrik Caubo was a man of vision when he decided to build a public swimming pool on the banks of the river in the 1920's. Nowhere in the area was an opportunity for public swimming. So this was something special for Schin op Geul. Right on the banks of the river, adjacent to the falls, the future swimming pool was dug out. In those days, mixed swimming was strictly prohibited, so a wood partition had to be erected in order to divide the pool in two. It was not unusual that boys being boys tried to sneak a peek into the ladies' site of the pool. Sometimes the most daring dove under the partition to the other site, but in general owner Caubo applied the rules of separation in a strict manner. What else could one expect from a man who's job it was to uphold the law ? The swimming pool was enhanced with a small wood railroad building. He had purchased this from the Dutch railroad company. He built a brick addition to the latter. Whoever strolls or walks in that area nowadays, even after this long period of time, can see it as it still exists and has been changed to home. Of course about 20 stalls to change into a swimsuit had to be built and were completed by also constructing a "family change area" where mom, dad and the kids could go. For the people who did not own a swimsuit, a person could rent one for 10 cents. But on occasion the suit renters 'accidentally" took them home. He placed tables and chairs near the pool, where strollers, hikers and pool guests could sit down and drink something. The drinks were cold. The owner had constructed a grotto in the side of a steep hill where the chilly temperature was just right for the bottled beverages. The grotto still exists today. Also, Mr. and Mrs. Caubo sold the fruit of the orchard to the passersby. The pool, divided into two sections, received fresh water from 3 pipes connected to the river Geul. Another pipe allowed the water to leave at the other side of the pool to the lower part of the river, so there was a movement of fresh water at all times. There were two jump boards, used extensively. In addition experienced swimmers jumped from the falls into the river. But that was not without danger. But owner Caubo and the guard he employed were not too strict as far as that is concerned. Also the guard, for a fee, served as an instructor for non-swimmers. For that purpose, owner Caubo had invented and constructed a contraption in order to learn to swim. The student-swimmer would be outfitted in a sort of a leather harness, enter the river and be instructed how to swim. He or se would hang from a steel cable and the steel wheel rolling on top of the cable allowed him to move forward and safely swim and receive instructions.Mr Caubo also owned 3 rowing-boats. He rented them and the guests could row on the river. Another attraction was the miniature zoo Mr. Caubo had established near the Rozenhof. It consisted of one exotic animal: A monkey. The rest were animals caught in the area: Foxes, squirrels, many birds and small rodents seldom seen or found by the average citizen. It was a very interesting collection. The water of the river Geul was, by today's standards even on hot summer days very cold. But devoted swimmers accepted that. But then rumors of the "Weil disease"began to circulate. This was probably some sort of a virus. This endangered the very existence of the swimming pool for Mr. Caubo. It would require an expensive filtration system. It was closed. Now, a half a century later, one can still see traces of the swimming pool. Although it was a primitive at the time, it shows the daring spirit of a prominent citizen who looked into the future and accomplished something. Many people of the area learned how to swim there. Guests at the Rozenhof received the swimming pool benefits as a package deal. The waterfall, nowadays, had been damaged by high water. It has been repaired and looks different since the early days, when daredevils dove into it. Remains of the walkway are still visible. It was almost completed. But then the pool was ordered to close. All the rest are distant memories. Memories of a man, Jan Hendrik Caubo, who in his uniform of Chief of Police kept the order and enforced the law. Out of uniform he enabled and taught people how to swim by his daring project of building a public pool. The city of Schin op Geul does not exist anymore, only in name. It has been taken over by the nearby city of Valkenburg. As of 2005, all children have passed away. 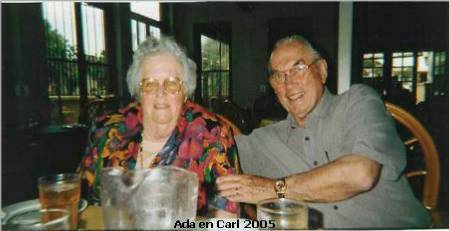 The last surviving spouse of one of his children (a daughter in law) is still alive in 2005 and is her nineties. Jan Hendrik Caubo died in Schin op Geul in 1945. All his children attented the funeral. The only one absent was his oldest son Jean, who died in Dachau concentration camp in Feb 1945. Source: Periodic Geulrand nr. 5 ; Jan 1984. (They married on Jan 10 1824). The first son from this marriage was Jan Willem (1824) and the third son was Jan Lambert (1829). 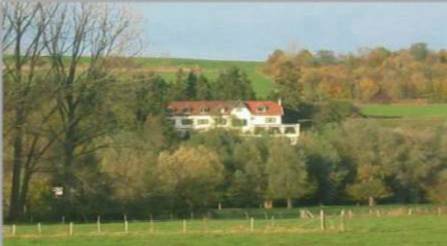 The children grew up in Kapolder, a tiny village that still exists and can be located between Wijlr� and Partij. 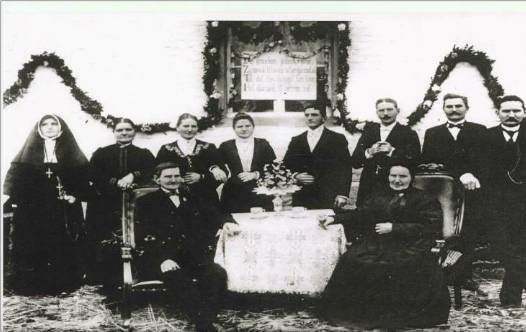 At age 25 (June 26 1851) Jan Pieter married Maria Alexandrina Knops and moved to the town of his bride Wahlwiller-Wittem. Jan Pieter Caubo died 80-years old on April 9 1907 in Wahlwiller-Wittem. 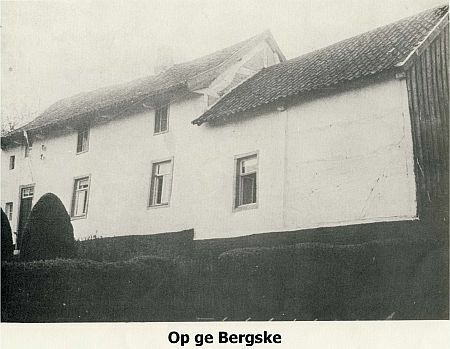 1) In 1881 papers were drawn to divide the property into three parts by three brothers Jan Willem, Jan Pieter and Jan Lambert (Three other sons from the family had passed away). The total of the estate was estimated at 4200 guilders and every child received 1/3 of the possessions to be divided. The oldest son Jan Willem took the farm and part of the grounds in Kapolder. The other brothers divided the remaining real estate consisting of orchards, meadows and farmland. 2) The other document shows an announcement in the year 1904 (See picture). 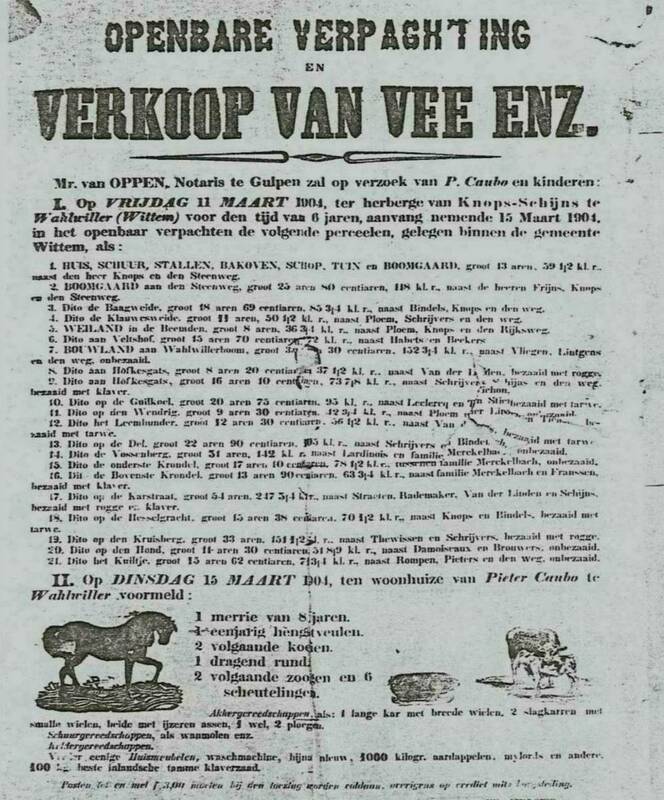 According to this announcement Jan Pieter, who by now was almost 80 jaar and a widower, offered his 4 acres of land and orchards for lease. He also offered for sale his cattle, some household goods and farming equipment. Source: Notebook Jan Pieter Caubo Life and Work 1883-1973 Vaals. "IN MEMORIAM"STONE ON THE CHURCH WALL IN SCHIN OP GEUL. 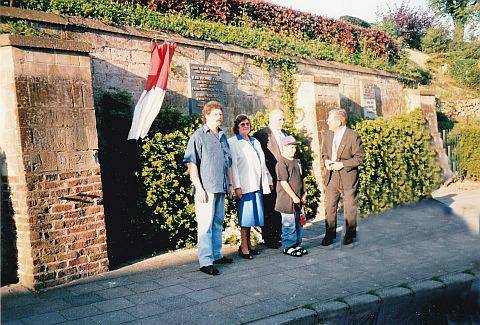 The picture above shows the "In Memoriam" Stone located on the wall near the church square in the center of Schin op Geul. Together with the names of two other Schin op Geul citizens you will find the name of Jean Michel Caubo, also known as Johannes Michael. He was the oldest son of Jan Hendrik Caubo. The story of what he did during World War II can be found in the book: "War Memories" issued by the Heemkundevereniging Schin op Geul. Also: In the World War II book "Flee the Captor" by Jean Weidner his name can be found 24 times. It describes what happened, what he did, how he was arrested by the Gestapo and how he met his end in Dachau. It is also described on the Caubo website under "Interessante sites". We also thank and recognize Eveline Caubo, who was instrumental in establishing this . Wednesday May 4 1995 was the date that the Stone was officially shown to the public. On May 4 2005, the 60st anniversary of remembering the World War II dead who had sacrificed their lives for their country, there was a gathering where mayor C.A.C.M. Nuytens in name of the city of Valkenburg laid flowers and delivered a speech. The same was done by Eveline Caubo in name of the Caubo family. 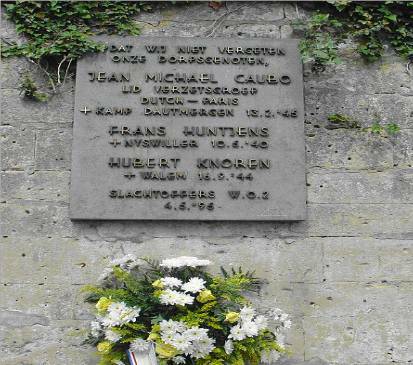 *Interesting footnote: Jean Michel Caubo is also remembered at the War Monument in Senlis France, 40 kilometers North of Paris France and at the Gare du Nord in the city of Paris France. From the Schin op Geul branch two Caubos emigrated to the United States of America. 1). Jean Henri Caubo married to Cornelia Eestermans. 2). Joseph Hendrik (Harry) Caubo married to Josephina (Josie) Schols. 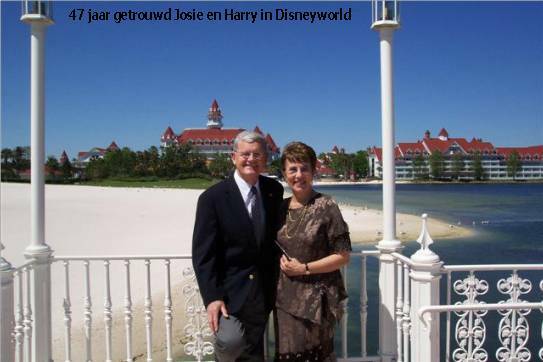 Harry was born on August 16 1932 in the Vroedvrouwenschool in Heerlen Holland, the oldest zoon of Hubert Joseph (Jos)(Sjöf) Caubo and Maartje (Marie) Schaap. In 1933 his brother Adolf Hubertus (Dolf) was born and on April 18 1940 his sister Eveline Anna Maria (Eveline). His military service was with the Korps Commando Troepen (The Green Berets) in Roosendaal Noord Brabant from1952-1954. In 1953 he was active during rescue operations in Zeeland when the dikes broke. Before emigrating to the United States he worked for 10 years at the post office (Honigmanstraat) in Heerlen Holland. The situation in Holland during that period due to World War II, was difficult. For instance: A young couple, wanting to get married had to be on a waiting list for housing for years due to the housing shortage. And this was just for renting a house or an apartment. Furthermore, wages were extremely low and prospects were dim. Harry and Josie were engaged at that time. Young people are adventurous and want to get ahead and build a life. They had known the Americans (The liberators in 1944-1945) and loved them. At that point in time the Dutch government stimulated emigration and had set up offices all acros the country to help citizens who wished to emigrate with the paperwork, visas and information. Most people went to Australia at that time. On January 7 1958 it all happened. They emigrated on that date to the United States and ended up in Miami Florida. They were married in Miami Florida on April 26 1958 in the St. Peter and Paul's Church. As for all emigrants the initial jobs were low paid, entry level types of jobs, but very soon things improved. Harry landed a position with an American Airline (Delta Air Lines), where, eight years later, he became a manager and stayed for 34 years. Josephina (Josie) went to school and earned her diploma as a licensed registered nurse. She worked in hospitals in Miami Florida and St George Utah. She really loved her job and for that reason she still works one or two days a week in the emergency room. Their son Paul and his family live in Baltimore Maryland on the East coast of the United States. He graduated from the United States Merchant Marine Academy in New York. For several years after graduation he was a captain on sea going vessels. He then changed to be a ship's pilot on Chesapeake Bay. His assignment is to guide ocean vessels from Baltimore harbor via Chesapeake Bay to the Atlantic, a 165 mile trip. He then guides other ships arriving from across with as destination Baltimore back via the Bay. Looking back, they have had a wonderful life in the United States. At first they spent 34 years in Miami Florida and since 1993 in beautiful Southern Utah in the far West. They never regretted having taken the big step. The United States is a beautiful country, a country of freedom, a large country. To fly across from East to West takes about 6 hours of flying. There is plenty of elbowroom. There are national parks in the States larger as Limburg and N.Brabant in the Netherlands together. 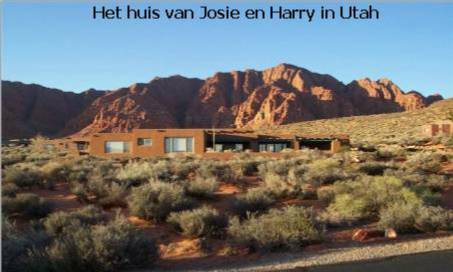 Harry and Josie now live in Southern Utah surrounded by beautiful nature, two hours from the Grand Canyon and very close to Zion National Park. From 1944 he served several years as a S/Sgt in the U.S. Army in the E.T.O (European Theatre of Operations) and later in the Netherlands Forces ending up in the jungles war in Indonesia. He arrived back in the Netherlands in 1950. After working in the garage business in Vaals, he decided to migrate to Australia under the Ex-Servicemen's Scheme. He met a beautiful Australian girl named Ada Mitchell. They were married in 1959 and had 2 sons, Paul and Martin. Paul is a Heavy Duty machinery repairer and long distance transport driver and Martin is an Officer in the Australian Royal Air Force (see personal details under Family tree Parenteel Vaalser branch under 1.1.4.2.1 and 1.1.4.2.2). Carl became an Australian citizen when naturalised in 1957 and in that way he was the first Australian Caubo. Carl had a career in Accountancy, Credit and Financial Management, and before retirement he was the National Credit Manager for his company in Australia. Ada and Carl are both volunteers of the Red Cross and are also involved with the Returned Servicemen's organizations. They have a very happy marriage and have travelled overseas several times. They live in Western Australia in the capital-city called Perth. It is said that we should: "Go and multiply" which they have done, hence the name Caubo is now known in Australia. The Caubos in Australia have always wondered where the name Caubo originated. (or caupo) was a Latin naming of a Landlord/Innkeeper/Host ! ???? Fam. C.F.& A. Caubo-Mitchell 10 Hendra Street Cloverdale 6105 Western Australia. On the Internet site of the Mormons you also find the name Caubo and among other things a number of Caubos in Spain. Whether there is a relation to the Dutch Caubos is not clear. But it could be a confirmation of the assumption that the Caubos initially come from Spain. - Joan Miquel Joseph born in Camplloch Gerona Jan 27 1780. - Maria Victoria Theresa born in Camplloch Gerona Jul 14 1785. - Catharina Victoria Y Eularia born in San Martin Cassa de la Selva Gerona Jul 5 1795. - Estevan married May 14 1818 Rosa Christia (see 3). 2a.Marti Caubo married Maria Vincens. -Maria Francisca Rosa born in San Martin Cassa de la Selva Gerona Jul 31 1806. 3. Estevan Caubo married Rosa Christia May 14 1818. -Maria Catharina Josepha born in San Martin Cassa de la Selva Gerona Oct 17 1819. -Francisca Rosa Antonia born in San Martin Cassa de la Selva Gerona Sep 1 1822 married Angel Barnes Nov 11 1850. 4. Theresa Caubo married Miguel Sole. -Antonia Vincente Francisca Sole Caubo born in Vidreras Gerona Jan 23 1824. -Francisca Coloma Theresa Sole Caubo born in Vidreras Gerona Mar 4 1816. -Maria Francisca Catharina Sole Caubo born in Vidreras Gerona Dec 8 1820. -Maria Catharina Rosa Sole Caubo born in Vidreras Gerona Aug 15 1814. Resistance worker and War victim. *April 28 1891 in Maastricht , Holland. +February 13 1945 Dautmergen, Germany. Jean M. Caubo was born on the 28th of April 1891 in Maastricht Holland. His boyhood town was Schin op Geul, Holland. He was the oldest son of Chief of Police Harrie Caubo and Marie Direx. He went to work for the Railroad Company as a steward on the international route between Amsterdam-Paris. He married a citizen of Luxembourg: Marie Schenck. Meanwhile he advanced to the position of serveur-recerveur with the French-owned Wagons-Lits Railroad and made Paris, France, his home. He lived there for about twenty years until his death in February 1945. He adapted his first names to the language of his new country: Jean Michel. In 1927 he lived in Montrouge; a small suburb of Paris. It was there where on June 18 1927, twins were born. Two boys: Henri and Josy. Seven years later, on June 18 1934, Jeannine Anne was born. Noteworthy is that all three children shared the same birthday: June 18th. At that time their address was: 189 Rue de Faubourg Poissonniere, Paris 9 arr. When WW II started in 1939 and 1940 and Europe was overrun by Hitler's nazi hordes, Marie and the children were on vacation in Luxembourg. It took over a year before the family could be reunited in Paris. Jean was alone in Paris for the entire period. No cross-border travel was permitted by the Germans. During the war Jean was active in the resistance. In the early period he assisted people who were fleeing from the Germans from their respective occupied countries and who used the international train route as an escape for that purpose. Later on he joined the "Dutch-Paris" resistance organization. By that time international train traffic had ceased and he was reassigned and working at the Gare du Nord in Paris. The resistance group was headed by Jean Weidner, a Dutchman who owned a textile business in Lyon France. Other members in the group were a.o. Herman Laatsman; Jaques Rens; Benno Nijkerk en Salomon Chait. This group's work included arranging and organizing escape routes from German occupied countries to Switzerland and Spain. The organization was credited with saving approximately 800 Jews and 200 allied personnel during the war. The involvement of the Family. The following is what is known. There could be more that happened at that point in time, but impossible to trace. The two sons, twins Henri and Josy, were also doing their share. Being born and raised in Paris, they were very knowledgeable about the streets of Paris and knew their way around. At times they were instructed to go to the Gare du Nord and meet certain people who were on their way to escape the Germans. The boys, then 16 or 17 years old, would walk and guide them from the Gare du Nord to certain Metro underground stations, where someone would take over. In order to avoid suspicion and not walk as a group, the people involved would follow the boys from a distance. About Mrs Caubo: She was fully aware of her husband's activities. On the day of the family's arrest, as the arresting officers were closing in on their home and just in time, she managed to hide and destroy important papers. She was able to hide parts of it in empty cups and bowls in the kitchen cabinets and flushed part of the papers down the toilet. The above information was given and told by the surviving son Henri. His brother Josy was killed in Paris in an airplane crash on July 21 1951. A very dark day for the resistance: February 9th, 1944. On February 9th, 1944, a female courier of the "Dutch-Paris" group, Suzy Kraay, was arrested by a French police unit, the Brigade d'Interpulation. It was a special police unit sympathetic to and cooperating with the German occupying forces and rife with collaborators. When captured, she was in the possession of a notebook with names and addresses. She attempted to toss it away, but the police recovered it. One of them looked at it, smiled and said: "This is exactly what we are looking for". The names in the notebook included the name and address of Jean Caubo. This was the cause and reason that Jean and his family were arrested on February 12th, 1944. After a few days Mrs. Caubo and the children were released. But Jean was kept in captivity at the prefecture of police. Later in the evening he was handed over to the German enemy, together with Suzy Kraay. They were sent to the notorious SD section located in the Rue de Saussaies in Paris. (SD was "Sicherheits Dienst", meaning Security Service, who were feared for the interrogating methods they used). Jean was accompanied by six armed German soldiers and handcuffed to Suzy Kraay. -The prison at Romainville in Compiegne. -The Aussenkommando Dautmergen. Here he died on February 13th 1945. Now to Holland in 1945. Was Jean M. Caubo dead or alive? Nobody in Holland knew. There was a World War going on and no information was available. Borders were closed shut, international mail had stopped, except for a few Red Cross letters that managed to get through. No one in Holland even knew that he, Jean, had been arrested. How was his family ? No international phone traffic and few people, except some businesses had a phone. Misinformation and a lack of it were prevalent. For many people, the only source of information was German propaganda in newspapers. All radios in the country had been confiscated. The last contact with Jean, only known after the war, was when his son Henri, then 17, was allowed five minutes with his father at the prison in Compiegnes. Jean was marched into a room by two gun-toting German soldiers. Henri told his father that his wife had died during a bombardment of Paris. What can one say in five minutes? All Jean could say was: "Son, after the war we will straighten this out". This was the last time Jean was seen alive by his family. Locating and taking care of the children. We now turn to the period after May 5th, 1945, the day the Germans surrendered: The story about Jean's brother Jos. Jean's brother Jos in Holland had promised him that he would take care of the family if anything would happen to him and he was ready to face that challenge. He began by doing everything in his power to find out what had happened to his brother and his family in Paris. The first clue appeared well after the end of WW II. Jos received a letter from another political prisoner, dated August 22 1945: M. van Beek. He reported that Jean had died by the end of 1944 in Dautmergen and that the children were still alive. Here is a quote from his letter: "During our captivity Jean was an excellent friend and his optimism was always an inspiration for us. He was always optimistic and kept our spirits up. But unfortunately, he did not make it in the end". The date of his death was not correct, however. One can understand this when one is in captivity in a concentration camp and loses track of time. 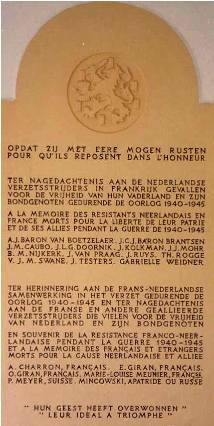 On the 28th of September 1945 Jos was officially notified by the Dutch Red Cross that Jean, his brother, had died in Dautmergen concentration camp on Feb 13 1945. He was only 53 years old. On October 16th 1945, another fellow prisoner and survivor, a Belgian by the name of Bert Spierings from Rekem Belgium, got in touch with Jos in Holland and confirmed Jean's death. It took more than a year before the death of Jean finally was accepted and entered in all official records by the various authorities. On February 11th, 1947, his brother Jos in Holland made an attempt to get assistance to try to locate the body to be buried in his homeland. But the body was never located and the attempt failed. Now the concern was for the children. There was great doubt as to what had happened to the children. Due to the war, there had been no communications between the families in Holland and France. Also, even after the German surrender the borders were still closed; no phones; no transportation; no money transfers were allowed across the borders etc. This lasted for months after the war. No passports or visas could be obtained. Jos had no idea what a long and tortuous road lay ahead of him in order to be able to keep his promise. Immediately after the War Jos tried to obtain a passport and visa to France. That also meant papers for Belgium, located between the two countries. He was driven by the fact that only he himself could go there and see for himself what had happened to the children. On November 15th, 1945, six months after the war ended, he finally obtained permission and a visa from the Dutch government to go to France. He arrived in Paris and did what he had to do to get the children to Holland. He also contacted Jean Weidner and Herman Laatsman, with "Dutch-Paris" for assistance and they came through with their full support. They assisted him in every way possible. He then took the two boys with him to Holland. Their sister Jeannine remained with Marie's brother Victor Schenck and his wife, who took her to their home in Belgium. The boys arrived in Holland in December 1945. On March 14th, 1947, Jos Caubo was officially assigned as legal guardian for the three children by a Dutch court. Mr. and Mrs. Frits Rijcken (Jos' sister and brother-in law) were assigned as second in line. They had no children of their own; they had a large home and the two boys stayed there for most of their time in Holland. The legal guardianship had finally been settled. Although Jos Caubo was also granted legal guardianship for Jeannine, now living with her uncle and aunt in Belgium, he was unable to get her to Holland. This was due to the fact that court proceedings in Holland and Belgium were complex and not compatible. This made legal custody procedures very complicated. Although Jos had the legal rights, he finally approved for Jeannine to remain in Belgium, especially since she had expressed a strong desire that she preferred to be in Belgium. The two boys, in Holland since December 1945, were drafted into the Dutch navy and the army. Henri was assigned to the Royal Navy; brother Josy to the army. (De Huzaren van Boreel). Both were sent to the Dutch East Indies, where the Dutch government was fighting the insurgents for independence. After they returned from the military service, Josy returned to Paris where he worked for an optical instrument company. On July 21, 1951, one day before his wedding, Josy was killed in an airplane accident in his beloved Paris. He and four others were on a mission to photograph Paris sights from the air. The aircraft crashed in Le Vésinet, a suburb of Paris. All five were killed. Henri married Corrie Eestermans in The Netherlands after his return from the Dutch East Indies. 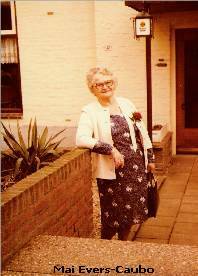 But he saw no future in Holland and emigrated with his family to the United States in 1957. Here he died on October 12th 2008 at age 81. Jeannine married in Belgium and has remained there ever since. Recognition of Jean M. Caubo. Received by his family posthumously. -March 5 1945: The French-British Croix d'Honneur. -September 6 1946: The Knights Cross of Lotharingen. -Official Recognition from The United States of America, signed by Dwight D. Eisenhower. -March 30 1947: A letter from Queen Wilhelmina to the children. -June 8 1983: Het Verzetsherdenkingskruis. -A British Medal and Certificate, signed by Deputy Supreme Commander Air Chief Marshall Tedder. Places where Jean M. Caubo is remembered. -A plaque at the Gare du Nord in Paris France. -In Orry-la-Ville, 30 miles North of Paris France. A plaque on the wall with his name; Gabrielle Weidner's name and eleven others in the chapel and Place of Honor. -His name on a bronze plaque on the outside churchwall in his boyhood hometown of Schin op Geul, Holland. WW II had many victims; millions and millions. This is just the story of one man and his family who tried to save Jews and Allied Personnel from the enemy. He never hurt anybody or did anything violent in his life. Not even violence against the Germans. But he was arrested and his punishment was harsh and swift. Death in a concentration camp. This gentle person never saw his children grow up. He lost his wife during a bombardment while he was in German hands. He never was able to guide his children to a bright future. It must have been pure hell for him to know that his wife had died and the three children were alone and his chances of survival were slim. It was a tragedy. He could not even be laid to rest in his homeland. His end came on February 13th, 1945, in Dautmergen Germany where he is buried, somewhere unknown. -Book "Vlucht naar de Vrijheid"van Herbert Ford. -Book "Oorlogsherinneringen 1939-1945 Schin op Geul"van Heemkundevereniging Schin op Geul.